What is Muscular Dystrophy Disease? Today's date is - Muscular Dystrophy - also known as MD is a group of more than 30 inherited diseases. They all cause muscle weakness and muscle loss. Some forms of MD appear in infancy or childhood. Others may not appear until middle age or later. 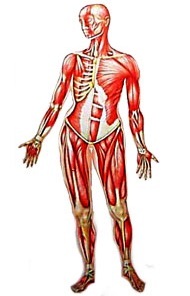 The different types can vary in whom they affect, which muscles they affect, and what the symptoms are. All forms of MD grow worse as the person's muscles get weaker. Most people with MD eventually lose the ability to walk. Muscular dystrophies (MDs) are a group of disorders that result in muscle weakness and a decrease in muscle mass over time. The disorders within this group differ in the muscles they affect, the age when signs are first seen, and the genes that cause the disorders. Duchenne muscular dystrophy (DMD) is the most common form of muscular dystrophy among children.1 DMD occurs among approximately 1 in 3,500 to 6,000 male births. This broad range reflects studies of different groups of individuals around the world. Usually, a person with DMD loses the ability to walk sometime during the period when he or she is 7 through 13 years of age, and can live into their 20s and 30s. Becker muscular dystrophy (BMD) is a milder form of muscular dystrophy. BMD affects about 1 in 18,500 male births. Signs of BMD are similar to those for DMD. Typically, people with BMD lose the ability to walk after they are 16 years of age. Together, DMD and BMD are called Duchenne/Becker muscular dystrophy (DBMD). Over time, the muscles of people with DBMD get much weaker. While there currently is no cure for DBMD, there are many treatments that can help people with the condition. Babies and children should reach milestones in how they play, learn, speak, and act. A delay in any of these milestones could be a sign of DBMD or other developmental problem. Visit our “Learn the Signs. Act Early” web page to see milestones that children should reach when they are 3 months to 5 years of age. DBMD is present at birth and mainly affects males. DBMD is caused by a change (mutation) in the gene that makes dystrophin. Dystrophin is a protein found in muscle. Dystrophin is important because it helps muscles stay healthy and strong. Among boys with DMD, there is very little or no dystrophin, causing muscles to weaken and atrophy (or can use decrease in mass or waste away) over time. Among boys with Becker muscular dystrophy (BMD), there might be small amounts of dystrophin, but the dystrophin might not be enough to keep the muscles strong. DBMD can run in a family, or it can be caused by a new change in the gene that makes dystrophin. 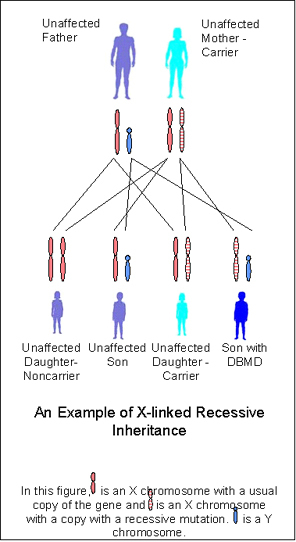 The change in the gene that causes Duchenne/Becker muscular dystrophy (DBMD) happens on the X chromosome. A boy gets an X chromosome from his mother and a Y chromosome from his father. Only the X chromosome can have the changed gene that causes DBMD. Females almost never have DBMD because they have two X chromosomes. Even if a female has one X chromosome with the DBMD gene, her second X chromosome usually will make enough dystrophin to keep her muscles strong. Because a female can carry (or have) one DBMD mutation and not be affected, she is referred to as a carrier. As a carrier, a female does have a risk of passing the same mutation on to her children. Each son born to a carrier female has a 50% chance of inheriting the DBMD mutation and having MD. Each daughter born to a carrier female instead has a 50% chance of inheriting the DBMD mutation and becoming a carrier like her mother. Although most males diagnosed with DBMD are known to have inherited the mutation from their mothers, about one-third of cases are the result of a new mutation in which the mother is not a carrier. Rather, the new mutation happened randomly in the fertilized egg. In these cases, it is unlikely that other children of that same couple will be affected similarly by DBMD. CDC has funded childmuscleweakness.org, a Web-based tool to help primary care clinicians, therapists, and other specialists diagnose child muscle weakness. Child muscle weakness applies to muscular dystrophies and other childhood neuromuscular disorders. Doctors use lab tests to diagnose a person with DMD. Typically, boys with DMD are diagnosed sometime during the period when they are 3 to 6 years of age, even though there might be earlier symptoms. Doctors can test the level of creatine kinase (CK), a protein in the blood. CK levels are higher among people with DMD. Doctors can test the gene that makes dystrophin. Doctors can do a muscle biopsy. This is a minor surgery in which a doctor removes a small piece of muscle and tests it for dystrophin. Among people with DMD, there is very little or no dystrophin. Among people with BMD, there might be small amounts of dystrophin. Complications occur over time as DBMD progresses. The main complications of DBMD are problems with muscle health, bone health, heart health, breathing, digestion and nutrition, and emotional and mental health. While currently there is no cure for DBMD, there are many treatments that address the complex needs of people with DBMD. Treatments for DBMD need to include different specialists working together to improve quality of life. Every person who has DBMD is different and treatment will vary depending on a person’s age and needs. A health care professional can recommend different treatments for each of these complications. Early intervention services help children learn important skills. These services can improve a child’s development. Even if the child has not been diagnosed with DBMD, he or she might be eligible for services. These services are provided through an early intervention system in each state. Through this system, you can ask for an evaluation. In addition, treatment such as physical therapy often does not need to wait for a formal diagnosis. Having support and community resources can help increase confidence in managing DBMD, enhance quality of life, and help meet the needs of all family members. It might be helpful for parents of children with DBMD to talk with one another. One parent might have learned how to address some of the same concerns another parent has. Often, parents of children with special needs can give advice about good resources for these children. The choices of one family might not be best for another family, so it’s important that parents understand all options and discuss them with their child’s health care providers. Connect with the Muscular Dystrophy Association to get information about clinics, support groups, and summer camps. Find families and events in your area through the Parent Project Muscular Dystrophy, an organization whose work focuses on Duchenne Muscular Dystrophy. Use the Parent to Parent Programs website, which provides information and support to families of children who have special needs.